It’s one in the afternoon in the Ekin Museum called “Ekinkura” in Akaoka city. A woman in the museum says to me, “Watch your step. This way, please.” She passes me a paper lantern. When I turn on its switch, in the darkness, a blazing red color called “Chiaka” spreads out as far as the eye can see. Some look of pain on her face and there is bleeding from her lip, others are crying with laughter. They all have a lot of energy which seem just about to start moving or come from out of the darkness. And when I bring a paper lantern close to them, I suddenly notice that they are on the planar painting on a folding screen. “Wow! This is Ekin’s works! !” I’m here alone, but the words just jumped out of my mouth. I come here to learn about Ekin’s life, however, I become absorbed by Ekin’s fantastic works as I almost forget my central aim. Ekin’s works are all famous and I’d like to explain in detail about two of them in the museum with which I was very impressed. Ekin (1812-1876) was a painter from Kochi Prefecture during the last days of the Tokugawa era. He was often called Ekin in spite of his given name “Kinzo Hirose” , and his numerous pen-names such as “Jyaku-oh”. The name of Ekin have two meanings: Kinzo Hirose who was Goyo-eshi (Purveying painter to the regime) and a painter in Kochi, especially pupils of Ekin. Thus, His name, Ekin has become a synonym for an artist. A man tied the nuptial knot with a woman and she gave birth to a child named Minosuke (三之助）. The couple went to Oumi (近江）with their child and they retired into the country . They hid themselves because they had married although the husband had had a fiance in Kyoto. One day, while the parents tended their land, a giant eagle came flying in and carried off their child, Minosuke, who was riding the cow. The parents were driven mad with pain and father died of sorrow. Many years after his death, his mother wandered from place to place throughout the country to find her lost child, Minosuke. Fortunately, her child grew up to become the Priest at the Todaiji in Nara after being rescued from the giant eagle’s nest by a holy priest. At last, they are reunited. In this work, Ekin drew the common people who had plenty of heart , who was filled with mother and child although his painting on a folding screen have some cruel scenes. 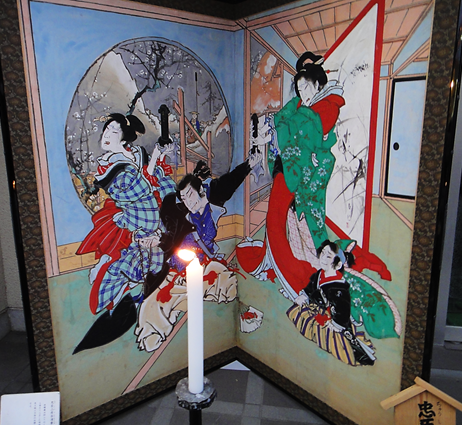 And It’s designed to take people by surprise as if we can hear sounds of a shamisen and gidayu-busi, which a style of dramatic narrative used in the puppet theater. However, even if Ekin drew a very tense situation, there is a humor in his works. At the lower left in this work, there are a couple who are looking and pointing at a child who is being swept up by a giant eagle. They open their mouth wide and their child who is being carried on his mother’s back is about to turn upside down and fall from her back. Ekin drew these figures as a laugh. However, as for me, I can’t laugh although they looks funny. 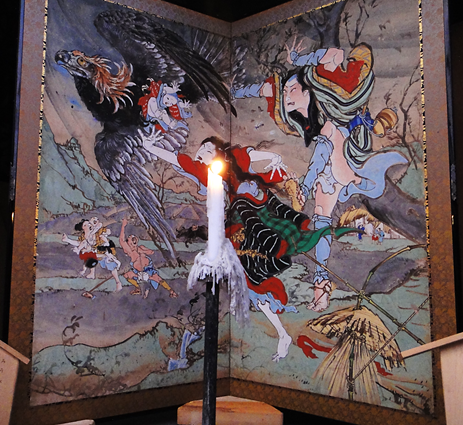 Ekin made a Kabuki drama of joruri of Gitayu the subject matter of a painting. Ekin drew his works roughly and in full color. Another of his characteristic style of a painting on a folding screen is “Iji Dozu Gaho” (異時同図法); a composition method used to show successive events within a united background. In this work (“ NIGATSUDO ROHBENSUGI NO YURAI”) he used this method of a painting effectively. This one is a fine artistic work. He admirably drew a full impact of a Steller’s sea-eagle, a screaming baby and the figures of parents frightened out of their wits and calling out at the top of their voice. In the background, there is in a extreme perspective. He expressed the violent incident which happened in a peaceful life as a splendid beauty. One day, Yuranosuke Ohboshi went out to take revenge on a person. Yuranosuke Ohboshi’s wife and her second son were waiting to hear the news of Yuranosuke’s revenge[b] in their house. Yuranosuke Ohboshi ordered Heiemon Teraoka to survive and tell information of the revenge to Yuranosuke’s family. Yuranosuke and his elder son admirably accomplished the revenge but committed hara-kiri. Heimon hand over the mortuary tablets to Ohboshi’s wife and his daughter-in-law Konami. While they shed tears, Heiemon committed hara-kiri and died, too in front of them. Then, an envoy came and selected Yuranosuke’s second son, Chiyosuke to become the feudal leader so as not to let the family line die out . There are some secrets in this work. First, in general, most of paintings on a folding screen which someone draw has no sign and seal. However, in case of Ekin’s works, we can find his sign and seal to make people notice who drew its work somewhere on his works. Have a look at a red-trimmed shoji on the right.Can you find a red point on shoji? There is his sign and seal on shoji. Ekin Second, as you can see, each of the two women have a memorial tablet. Of course, it’s the memorial tablets, but I’d like you to focus on its shape. You will find this is the shape of a symbol of man. Ekin also drew some secrets which people enjoy and which fascinate them. In the Edo period, there were only two pleasures for the common man to enjoy ; Sumo and a theater. Therefore, Ekin’s works are highly humorous and were drawn for a laugh. 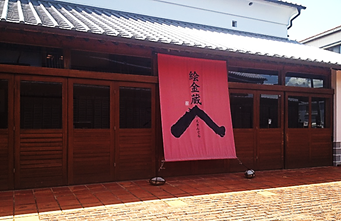 During the summer, many festivals which are associated with Ekin are held in Kochi prefecture. In the past, wide credence was once given to the theory; the soul of the departed go back to sea and their presence itself brings misfortune to people in Tosa. Therefore, in the festival, Ekin’s works used as a talism and exorcism. People display Ekin’s works just in front of the house because people believe that his ghastly paintings were too scary for an evil spirit to trespass on people’s homes. Ekin’s works are the very paintings which were expressed a lot of energy, humanity, and a desire of the common people who lived through the last days of the Tokugawa era, in a time of upheavals. As my time at the museum came to a close, I felt I was leaving a haunted house. “Thank you so much, it was very wonderful. I’d like to come here again.” I said to the staff and came out of the museum. The dazzling light blinded my eyes and I missed Ekin’s works in the museum as soon as I left there. 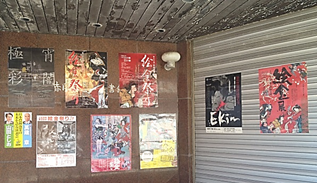 But, the more I walked around the town, the more I could find many Ekin’s paintings on the poster or a reed screen of someone’s house everywhere. Before I went to the museum, I just looked at the novelty of Ekin’s works, like bloody people. But since I visited the museum, I noticed myself that I’m thinking, “What secrets were hidden in this work? Where’s his brand mark? What’s going on? What are these people on his works doing?” while focusing on the details of his works. Definitely, my way of appreciating of Ekin’s works has changed. While walking around the town with those thoughts, I dropped in at a Japanese-style confectionery store named “Nishikawaya”. I bought some Japanese sweets and while eating them, I talked with a clerk. “ We have some Ekin’s works in every house in Akaoka city and in Kochi, until recently, people often used to ask children who were drawing pictures, ‘Will you be an Ekin?’ (絵金になるかや？) Actually, Ekin has died,” she said, “but he is still alive in Kochi as you can see many his paintings on a folding screen and his pupil’s works”. 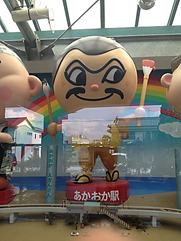 When I arrived at Akaoka station, there was a big mascot named Ekin. 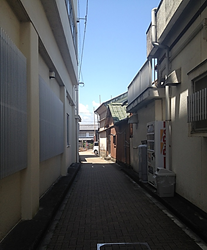 I left Akaoka City feeling as if I was watched over by Ekin. Thanks, Homi. I learned quite a bit about these pictures from your article.